Risk and opportunity are two sides of the same coin, and in a galaxy riven by war, there are many opportunities for those willing to take the risks. Across the stars, Smugglers flaunt the Empire's laws to turn a profit. These daring outlaws, scoundrels, and con artists gamble it all for a shot at getting rich - or at least breaking even. 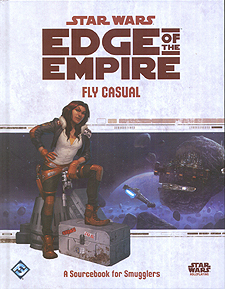 This rulebook expands on the Edge of the Empire Roleplaying Game adding new content for Smuggler characters as well as any other characters interested in pursuing fame, fortune and glory without bowing to harsh laws or society's demands. Charm marks to advance confidence schemes, gamble for enormous stakes, or fight in quick-draw duels against other notorious outlaws. Ships, vehicles and equipment for staying a step ahead of the law. Guidance for GMs looking to bring Smuggler themes, encounters and stories into larger campaigns.